Interchem Technologies (ICTA) is a results-oriented and environmentally sensitive company providing responsive cost-effective and technically sound service to the electronics, aroma and flavor, pharmaceutical and allied industries. 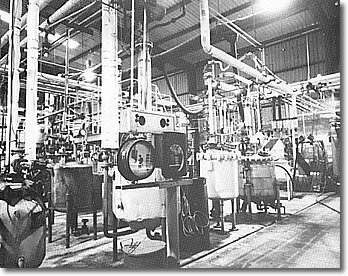 ICTA's blend of professionalism, project management, careful safety procedures, modern technology and techniques along with broad spectrum processing capabilities creates one of the most effective specialty chemical manufacturers in North America. ICTA can develop process technology for transfer to your facilities, can solve existing problems through advanced technology and can develop technology scaleup to manufacture for your needs. We have extensive equipment to accomplish this. Acetophenones, anthranilic acids, aromatic amines, amino acids, heterocyclic and aromatic aldehydes, arylacetic acids, cycloaliphatic ketones, lactones and lactams, naphthalene chemistry, aromatic and heterocyclic aldehydes, nitriles, aromatic and aliphatic acids, furans, indoles, isatins, pyrazines, and pyrrole chemistry. ICTA also manufactures entomological pheromones or synthesizes insect attractants for integrated pest management systems. ICTA offers a blend of professionalism, project management, highly specialized technology with broad spectrum processing capabilities and low cost pricing for your partner in production of specialized intermediates. The firm's strengths are its propietary production processes, flexible manufacturing capabilities, industry contacts, and strong research and development programs involving experienced management - resulting in unique and commercially viable products. ICTA specializes in the commercial production of organic and inorganic chemicals for the aroma and flavor, pharmaceutical, agricultural, aerospace, electronics and allied industries. ICTA also manufactures its own independent product line. Whether ICTA performs custom manufacturing or supplies you with one of its regularly produced intermediates, you can be assured of specification quality, timely delivery and a competitive price. Sophisticated Insect Pheromones - used in integrated pest management in agriculture throughout the world for mating disruption and monitoring fruit, vegetable and timber production. Plant Growth Regulators - used to stimulate rooting and plant growth as well as provide color retention during the fragile post-harvest period to market and extended market life. Others can increase the size, and ripening period required of vegetables. Pharmaceutical Intermediates / Raw Materials - used in Biotechnology for scale-up of active substances for clinical trial research. Novel insecticides which are environmentally friendly, and have either high knockdown capability or are anti-feedants. Specialty Products - including such diverse products as ink jet printer fluids to sophisticated polymer intermediates for optical recognition technology, as well as DNA screening. Flavors and Fragrance raw materials - currently under contract to manufacture components for blending into finished products - such as natrual Vanillin, caramelic and fruit and nut flavors as well as perfume bases. Copyright © 2003-2006. Interchem Technologies.